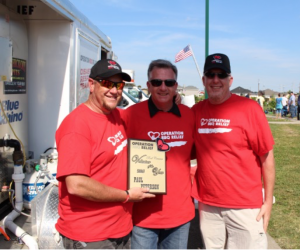 Paul Peterson, Operation BBQ Relief’s 2015 Rod Cramer Volunteer of the Year, loves cooking for large groups and has a passion for helping others. Like a lot of OBR volunteers, Paul was moved by watching the effects of a devastating tornado in Moore, Oklahoma that ravaged the area south of Oklahoma City and killed 24 people. A former competition cook, Peterson has committed to OBR by sitting on its Operational Team as the Director of Corporate Relations. He took a moment out of his busy schedule to grudgingly talk about himself when he said he’d much rather be talking about the efforts of others. How did you get involved in OBR? I first got involved with OBR during the 2013 Moore, Oklahoma tornado. I wanted to help in a way that I knew would make a difference in the lives of those affected by the disaster. I’ve always liked putting on “big cooks” and I like helping people, so for me it was a natural fit. After registering online as a volunteer I was contacted and left the next morning to assist with the relief efforts. Tell us about the work you have done with OBR? During the Moore deployment I realized how unique and important OBR was to the disaster response process. OBR accomplishes more during a disaster with fewer resources than any other group. OBR is primarily funded by individuals and small business directly involved with the relief efforts and, because of this, I have focused on two main areas. One area is to introduce corporations to OBR and provide them with an avenue to assist OBR either through products we would need during a deployment or through monetary contributions, both of which are critical to our future success. The second is to make sure all volunteers have what they need during a deployment so they can take care of those in need. In short… If Team OBR needs it, I go find it. What have you learned through your experience with OBR? You can accomplish a lot when you channel your resource as a team. Please expand upon how it’s impacted your life. I continue to be in awe of the volunteers that are part of team OBR. They motivate me to do what I do because I see them giving so much of themselves. The camaraderie and service that is Operation BBQ Relief gives me the satisfaction of knowing that I am part of something that is 100% about helping those in need. What do you want to say to anyone who might be thinking about volunteering? OBR is a volunteer based organization that needs people from all walks of life and all skill sets. The common thread of all OBR volunteers is that we have a desire to help those in need during a disaster. If someone has a desire to be involved other than through a deployment we have that too. OBR has needs year round to maintain equipment, manage inventory, and prepare for fundraising activities. If you have a desire to be part of something pretty special and to help us grow, we can find a place for you. Operation BBQ Relief’s mission is to provide meals and compassion for those affected by disasters when the local community cannot meet their needs. Mother Nature is spontaneous and unpredictable; we never know where or when she will strike. For those reasons OBR must rely on volunteers from across the country and have resources at the ready to deploy within hours of disaster striking. As the demand for our services grow, so does our need for volunteers and corporate sponsors. We are a team; we cannot do what we do without the support of our volunteers and our corporate sponsors that make OBR what it is. Side note: Paul is the founder and owner of Paramount Investment Services in Tulsa, Oklahoma where he lives with his wife, Toni. At the conclusion of this interview, Paul was heading out to celebrate his mother’s 80th birthday “again,” as he described it. He’s had to postpone the birthday celebration a couple of times because he’s dashed out the door to participate in relief efforts with OBR.